First: With which religious confessions will these declarations be made? I do not know if the Vatican’s ecumenical program will take place as proposed, but from what is said, there would be common declarations made with the so-called Orthodox and with heresies of various epochs, from the Monophysists to the Protestants. A declaration of “faith” with the Muslims and Jews at the top of Mount Sinai is also being planned. Second: When would these declarations be made? The Vatican press organs (Sala Stampa and Vatican Information Service) have announced that the signing of a common declaration between Catholic and Protestants on the doctrine of justification will take place in the month of October. A pan-religious journey in Rome, which promises to be a new Assisi on a grand scale, is also planned for the month of October. I have read reports that John Paul II will travel to Ur in November to begin his pilgrimage “in the footsteps of Abraham” That is to say, he would go to Ur (in present day Iraq), then to Canaan (disputed territory between the Jews and Palestines), perhaps go on to Bethlehem (Palestine), Jerusalem (disputed territory) and would end his trip on Mount Sinai with a sensational declaration of “faith” to be made together with the Muslims and Jews. Third: What can be said about the common declaration between Catholics and Protestants presented to the press on June 11 by Cardinal Edward Cassidy, president of the Pontifical Council for the Unity of Christians? This declaration intends to be the foundation for a more solemn statement to be signed in Augsburg, Germany. The date planned for the signing, October 30-31 of this year, was chosen to recall the date on which Martin Luther nailed the parchment with his 95 theses on the door of the Wittenburg Church and began the Protestant revolt. That Catholic Hierarchs would travel to Germany to celebrate the beginning of the most serious heresy that has shaken the West in the last one thousand years seems very serious indeed to me. Taking into consideration the symbolism surrounding the event, I would say that the very act is an homage to the heresiarch, which is not far from being an acknowledgment of his theses. Here I state my rejection of this homage and my enthusiastic admiration for the innumerable Catholics who fought against Protestantism through the centuries and whose memory will be insulted on this occasion. I propose to analyze a few general points about the doctrine of justification that provide the necessary presuppositions to understand what exactly is the “consensus” to which the Catholic-Protestant document refers. What is meant by “justification”? In lay terms, “justification” signifies the way that a man should live in God’s grace and merit eternal salvation. In theological language, to live in the grace of God means to be just; salvation is the reward for the one who merits it, for the one who is justified. Hence the study of this matter is called justification. There are fundamental points of our Faith related to the aforementioned common declaration. A.	Protestants say that faith alone is necessary for salvation; Catholics affirm that man should collaborate with grace by means of his works and, with this, become worthy of salvation. B.	Protestants affirm that man is necessarily evil and all his works are contaminated by this badness; Catholics distinguish between the tendency toward evil coming from original sin and the tendency toward evil that comes from free will, but they know that in human nature there are many things that are upright and ordered, and, further, they see in redeemed man the possibility to realize a supernatural good for himself and for others. C.	Protestants say that grace is given to men directly by Christ; Catholics know that grace proceeds from the Redemption of Our Lord, but comes to us through intermediaries: the Holy Church, the Sovereign Pontiff, head of the Church and Vicar of Christ, the seven sacraments; as well as through the mediation of creatures: the Virgin Mary, the Angels and Saints, etc. The reader will easily understand that from these examples proceed a great number of differences – the conception of the mission of Our Lady, of the Papacy, of original sin, of the sacraments, etc. 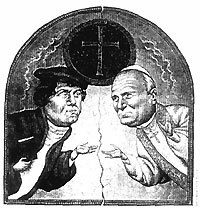 To the analysis of the Protestant doctrine the Church dedicated two Ecumenical Councils: the Fifth Lateran Council and the Council of Trent. Both Councils were very clear in vigorously condemning the errors of Luther and of Protestants in general. However, in the past month, we saw Cardinal Cassidy, attempting to justify the “consensus” reached with the Protestants, affirm that the condemnations of Trent should not be applied to the common declaration that he presented on that occasion. This statement of Msgr. Cassidy is quite strange. Until now the points of reference to judge Protestant doctrine were the two Councils that I cited, principally the Council of Trent. What does this statement of Cardinal Cassidy mean? Why would he make an exception to the doctrine constantly taught by the Church for the case of this declaration? The Cardinal is not clear on this point. It would be very helpful if he would explain it with more precision. For the common reader, the affirmation would seem to mean that the doctrine of Trent has been superceded. If my interpretation is true and if the same declaration will be signed next October, it seems that Catholics would be facing a revocation of the doctrine of Trent. Would a Cardinal have the power to revoke the doctrine taught by two Ecumenical Councils and afterward followed unanimously by the Church? Obviously not. Perhaps sensing the weakness of his position, Cardinal Cassidy affirmed that this declaration had been approved by the Congregation for the Doctrine of the Faith – Cardinal Joseph Ratzinger – and by Pope John Paul II. The question does not lose any of its relevance, but now should be raised on higher personages. Would it be the intention of John Paul II, supported by two Cardinals, upon approving the common declaration, to revoke the Council of Trent? Undoubtedly the power of a Pope is enormous. But if the present day Pontiff wants to revoke a perennial doctrine, this attitude asks a very careful position on the part of the faithful, because the teaching of Trent is guaranteed by papal infallibility. Would a Pope, John Paul II, basing himself certainly on the teachings of Vatican Council II, intend to revoke the infallible teaching of the Church with regard to Protestantism, based on the Council of Trent and the Fifth Lateran Council? How can one see clearly in this confusion, where on one side there are many Popes, two Ecumenical Councils and the constant teaching of the Church affirming one thing, and on the other, a Pope basing his action on Vatican II, proposing something in the opposite sense? Once the contradiction becomes clear, how should the faithful judge the present situation? What attitude should they take?